As this was a sattvika purana there was lots of information on Vishnu and his different names. It also identifies Vishnu with the brahman and says that Brahma and Shiva are a part of Vishnu. A major part of the Purana is spent on describing the virtues of worshiping Vishnu be it knowingly or unknowingly. There are many stories that show how you can be saved from hell just by cleaning a small part of Vishnu’s temples. Out of these many stories I liked the two given below. There once lived a king named Yajnadhvaja. He was very righteous and cleaned many temples of Vishnu. He also got a temple built on a river bank. The priest of this temple was named Vitahotra. Vitahotra was curious to know why Yajnadhvaja cleaned so many temples. Yajnadhvaja replied that he remembered his previous life, and this was what had happened. In his previous life Yajnadhvaja was the son of two evil people. His name had been Dandaketu. He was a sinner and killed people, drank wine and was a thief. One day, Dandaketu decided to take shelter in Vishnu’s temple. He used his clothing to clean a part of the temple so that he would be able to sit. He then lit a lamp so that he could see better. These two acts though done in ignorance pardoned all his sins in his earlier lives and the present one. He accumulated a lot of punya. Soon, some guards found Dandaketu and killed him. Since he was a sinner he should have gone to hell but because he had cleaned Vishnu’s temple he was sent to heaven in a beautiful vimana. He spent time in heaven and then he was born on Earth as the king Yajnadhvaja. Yajnadhvaja explained that his acts done in ignorance were enough to send him to heaven so what would happen if he consciously cleaned the temples. I liked this story as it showed that even the worst sinners could attain heaven if they cleaned Vishnu’s temples. Dandaketu was a huge sinner but even his two small acts were enough to pardon all his sins. It was a very interesting story and I found it amazing. My second favourite story is given below. Once Indra went to Brihaspati and wanted to know all about the manvantaras. Brihaspati advised him to go to a rishi named Sudharma who knew all about this. Indra asked Sudharma many questions. One of them was, what was the source of the rishi’s punya. In answer to that Sudharma narrated the story below. In his previous life Sudharma was a vulture. One day the vulture was sitting on a wall that surrounded Vishnu’s temple. A hunter shot the vulture and its dead body fell down. A dog came by and picked it up. The dog started getting chased by other dogs. While it was running it took a circle around the temple. This freed both the dog and the vulture from all the illusions and both of them went to heaven. This also earned them a lot of punya. I found this a fascinating story. Any dog will run while being chased like the dog in the story. It was surprising how this natural act of the dog was enough to send both of them to heaven. People should circle Vishnu’s temple so that they too acquire punya. I for one will always do it in future. The two stories above are the best from all the stories I’ve read so far. They were very interesting. Apart from these stories the Purana also gave a lot of emphasis on the different manvantaras and yugas. All of it was described in lots of detail. They also focus on the difference between each of the yugas. The Purana mentions the manvantaras of the future and the different Indras. Yama’s abode is described, and the different types of tortures are described. They even give the different ways that you can atone for your sins. 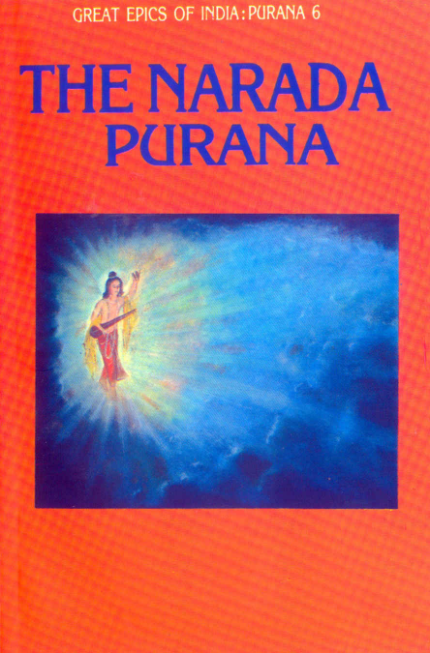 This was a very informative Purana and I learnt and read a lot of new things in it. Lastly, I will tell the amazing virtues of this Purana, so everyone will read it too. If you read one couplet from the Narada Purana, you are forgiven for all your sins. If you read one chapter you get the same amount of punya which you get if you perform a yagna. Ghosts, demons and thieves don’t come near this house. It is best if you read twenty shlokas every morning so that you are blessed.